I spent a weekend on a mountain in North Carolina at the gIRL gathering @ Black Mountain. It was a beautiful mountain. An incredible place that settled my spirit and allowed me a chance to just breathe in God. Just a week later and I’m deep in life again, but the mountain stays with me. gIRL (girlfriends In Real Life) began as a way to bring online friends together for fun, fellowship and time in the Bible. God’s plan is always so much bigger than ours. I wish I could explain what happened on the mountain, but I don’t have the words (shocking, I know). God did amazing work in the hearts of His gIRLs. Friendships were formed, sisterhood was strengthened, hearts were opened to His truths and lives were changed. God moved mightily and when Sunday came, I didn’t want to leave. Sure, I missed my family, but I didn’t want to leave the peace I’d found on the mountain. I wanted to stay and soak in more of Him. I wanted to spend hours digging into the Word of God with my gIRLs, I wanted to worship the Lord in that amphitheater under the canopy of trees. I wanted to dodge crashing acorns while singing to Him. But we had to leave. We packed up and headed down the mountain and back to life. But we headed back a bit stronger. I walked back into life with more knowledge of what it means to be an authentic person. A week later, I found myself in the same mountains with a completely different group of women. This group was so much larger, but no more precious than the group of gIRLs from Black Mountain. I watched authentic women and I watched unauthentic women struggle to fit in, be accepted and be a part of the group. I wished all 7000 of them could have a time like we did on Black Mountain. I was BLESSED to see two of my mountain gIRLs — Heather and Ellen! And I was such a JOY to hug their sweet necks! As I drove through the mountains Sunday, I realized that coming down a mountain requires lots of winding and curving left and then right. You don’t go straight down – you climb up and then down. And there are signs along the way to keep you on the path. I need signs like this as I come down the mountain we found with gIRL. I want to make sure I keep my feet to the course the Lord has called me to – I don’t want to spend time spinning my wheels in the grass. It’s so easy to miss a curve and get off track as you head down the mountain. It’s easy to zig when you really should zag. And it’s real easy to do when you don’t have any signs. I’m focusing on the treasure of God in my life – that He is the treasure and I’m the cracked, chipped clay jar. What about you? 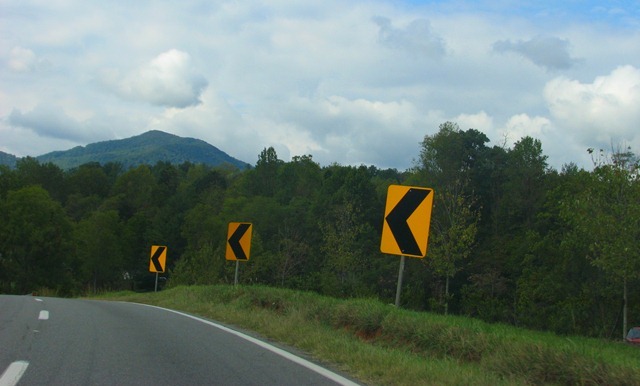 What signs are keeping you on the road? Mary, I miss you girl and I enjoyed reading this. What a treat that you were able to return to the mountain with a group of ladies. My prayer as I read this is that those who were not authentic would feel the presence of the LORD in their lives in a real way and as they do may they surrender to HIM and live their lives openly in HIM. Freeing is the word that comes to mind when I think of being authentic. I’ve shared three posts on my blog the week we returned but I still want to share on authentic and worship. I have numerous times since gIRL told my hubby I want he and I to go to the mountains…and he’s always wanted to but I, the city girl by heart was holding up the show. I think I’ve been converted :). I love nature but outdoors is a bit scary for me with the bugs, critters and things that may you go UGH!!! But again, after that mountain experience I think I’m converted. I miss you and all the gIRLS…so when is the next one? I want to be sure I plan ahead to be there. P.S. If you get to my neck of the woods you are MORE than welcome to my home!